"When I was 4 years old I told my grandfather, who was a fan of Jesse Owens, that one day I was going to win the Olympics. Since a little girl I have been headed in this direction. I'm still in shock. I am my own worst critic, but I honestly do not see what I could have done better", she continued in her message to the local press. "This is not sour grapes with me. I wish her the best. I just don't want the next kid to go through what I'm going through. This is supposed to be a country where you are free to fulfill your dreams." "The more I view the fight in its entirety the more nauseated I become", said Brother Deric Muhammad of the MMM Ministry of Justice. "The way Nia was treated was a slap in the face to Jesse Owens, Wilma Rudolph, Carl Lewis and to all who opened the way for the elimination of discrimination in the Olympic games." Joined by several dozen in attendance, Nia's parents, Thomas and Rhonda Duhart are outraged as well. "It is extremely painful to watch her go through this. She worked so hard to prepare herself to represent this country and she was robbed of her opportunity. Something must be done", said Mrs. Duhart. Mr. Duhart added that, "have always reviewed her fights and taught her to be the best. I can honestly say that she was at her best, but I believe that she was in their way." There is a worldwide movement afoot to get justice for the 2004 Olympic Tae Kwon Do Silver Medalist. Abdallah was robbed by the 2008 United States Olympic Committee in her Des Moines Olympic trial match against Diana Lopez of the newly famed Lopez family who is now appearing in many corporate sponsored commercials (AT&T, etc.) and who recently appeared on the Jay Leno Show. Videos of the taped battle have been circulating aggressively over the internet where 99% of the viewers vote Nia the winner "hands down". Countless blogs have been on fire with controversy over the injustice and letters are flying off to the USOC committee demanding answers. Nia trounced Diana so convincingly that the crowd erupted into boooos when Diana was declared the winner. While the Lopez family is highly respected in the world of Tae Kwon Do, experts declare that they are going to Beijing dishonorably and fear that the bureaucracy associated with last month's unbelievable outcome will represent a black eye for the future of the discipline which officially became an Olympic sport in the year 2000. Much has been made of the Lopez family being the first American trio of siblings to compete in the Olympics since 1904. But all one has to do is view the Nia vs Diana video and it is clear that their presence there will be more "marketing" than martial arts. 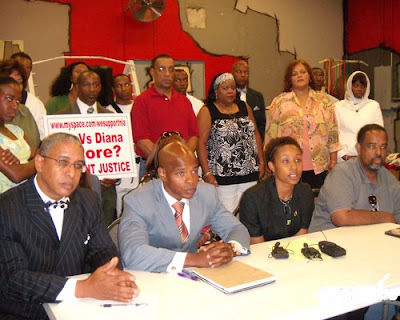 Attorney Warren Muhammad is representing the family and he commented that "While this case is about Nia Abdallah, it is about more than Nia. It is about every child, teenager and young adult who dedicates themselves to sport and aspires to Olympic competition. It is about insuring fairness, a level playing, where truly the best man or woman may win. It is about having rules and procedures in place for a fair and meaningful review, to ensure such fairness, and to protect the integrity of the sport and the individual contestants. These rules and procedures are lacking and wholly inadequate in the current state of affairs in Olympic Taekwondo competition. There is no meaningful review or process available to remedy an egregious, unjust decision, which dampens the spirit and kills the opportunity of contestants such as Nia Abdallah. The current process is a breeding ground for unfairness, subjectivity, collusion and fraud, which should have no place in a country that hold itself out as the standard bearer for Freedom, Justice and Equality. A Congressional Inquiry is needed to determine the merits of what has taken place in the debacle of the Nia Abdallah v Dianna Lopez match and the rules and regulations that govern the competition. " Supporters of Ms. Abdallah are in protest of the U.S. Olympic Committee's decision to publicly rob the American people of the most qualified athletic representative in that weight class. While international protests are taking place surrounding human rights in Tibet, they are not advocating an attempt to arrest the Olympic torch, which is supposed to be symbolic of freedom. "I thought it was an outrage…I have heard from Taekwondo stylists all over the country who are outraged by the poor judging", said Floyd Burke of Black Belt Magazine in a released statement. Protestors are also challenging all Tae Kwon Do athletes and enthusiasts in attendance in Beijing to stand and turn their backs moments before Diana Lopez competes in remembrance of the TKD principle of honor that was violated to advance her to the Olympics. We are demanding a full investigation by the House Judiciary Committee and there must be a change in the appellate process so that no athlete, regardless of race, creed or color will ever be robbed of their dignity and hard work the way Ms. Abdullah was. "I have watched and watched the video and Nia could have scored as many as four points in sudden death alone….Nia won hands down", said Alan Schein (co-author of the book Tae Kwon Do Basics and and international press correspondent for Masters Magazine. For more information on the case of Nia Abdallah visit www.myspace.com/WeSupportNia. I watched the match with a taekwondo master, and several international taekwondo champions and they were appalled and said that this is a travesty. We watched it again and they were disgusted. Brother Jesse, you are complaining about discrimination against Nia. She wasn't fighting a white girl. She lost, get over it. I watched Nia Abdullah fight Diana Lopez from the VIP seats in the Colorado Springs arena. Nia won. Period. She was robbed of her chance to fulfill her Olympic dream in 2008. This country wanted to build the legend of the Lopez dynasty, and to do this, they pushed Nia out and put Diana in. This government is famous for creating racial divisions, whether they be intra or inter racial. In this instance, they did it again. My hope is that Nia will continue to stand tall, like the African Woman-Warrior Queen that she is. African Woman-Warrior Queen? I thought Nia was an American.